Azerbaijani anti-corruption video blogger Mehman Huseynov has been released from prison, after serving a two-year sentence for defamation. This followed many years of repression by the authorities aimed at silencing him. On 26 December 2018, the Azerbaijani authorities put forward new criminal charges against him. These charges were dropped on 22 January 2019 following strong national and international protests. 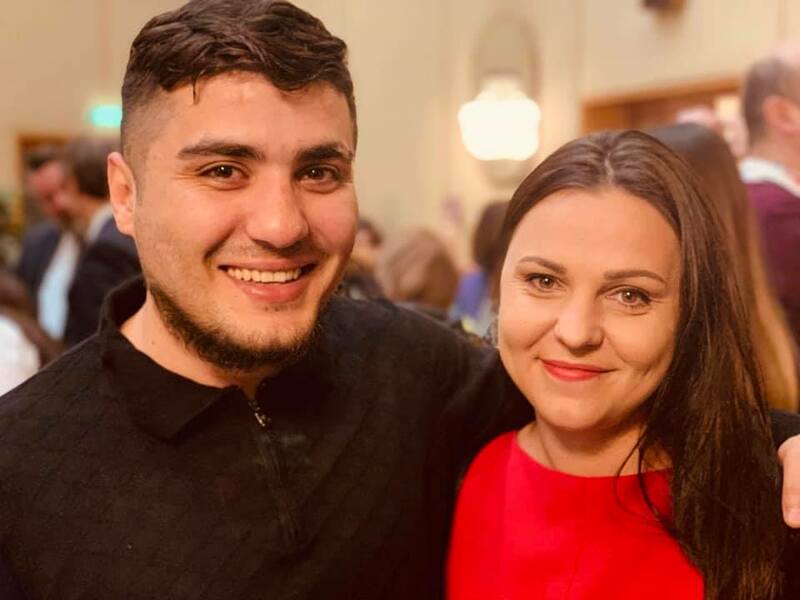 HRHF is so happy to see Mehman Huseynov reunited with his international colleagues after being permitted to leave Azerbaijan. 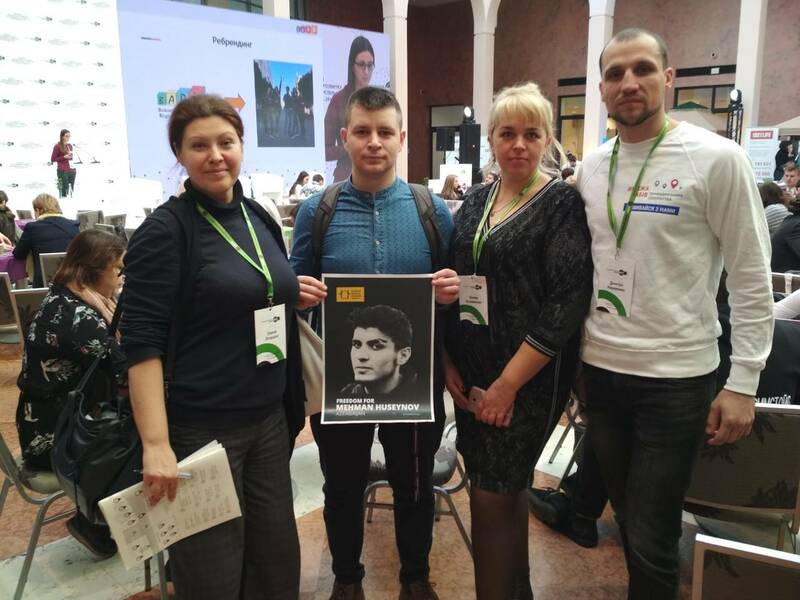 On Tuesday 9 April, Mehman Huseynov was prevented from travelling out of Azerbaijan, being stopped at the airport on the way to attend a conference at the Council of Europe in Strasbourg. 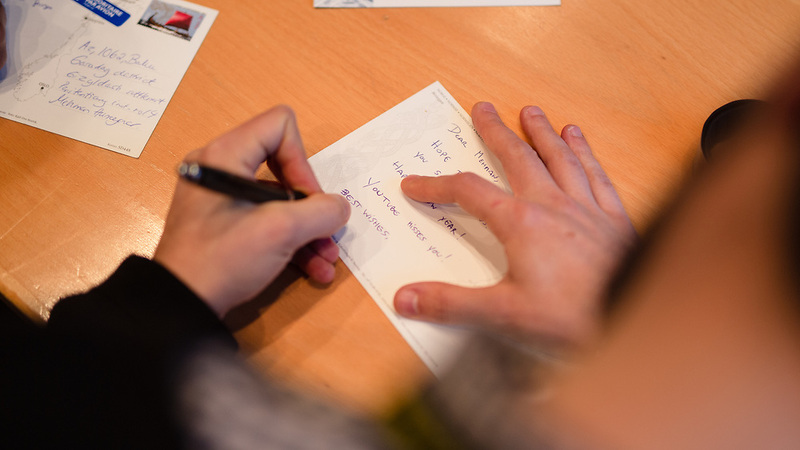 Following his release from prison on 2 March, Huseynov applied for a passport which he received on 4 April. However, it appears that on his first attempt to use it, the travel ban against him that was instated in 2012 is still in effect. 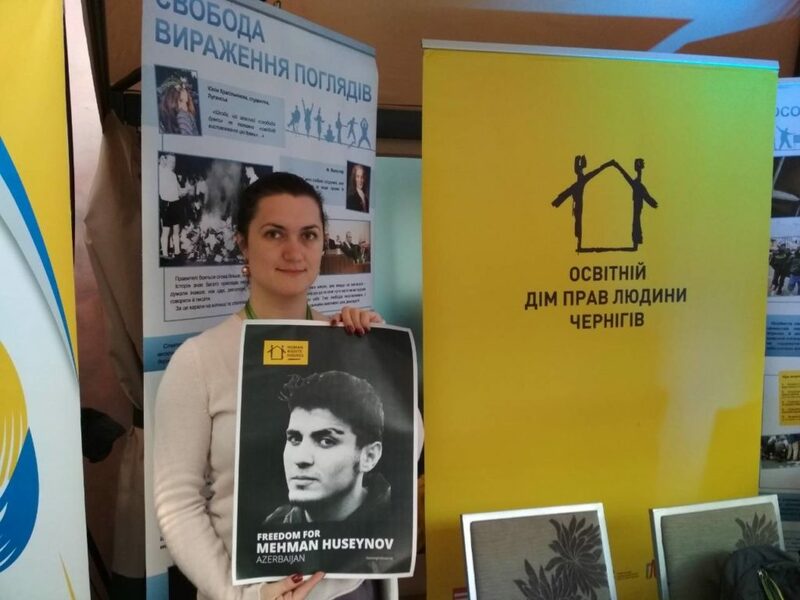 Mehman Huseynov’s legitimate work as a journalist and human rights defender, including travel to international fora, is invaluable to the society he lives in. We again ask the authorities to immediately reinstate his rights and lift the travel ban against him. 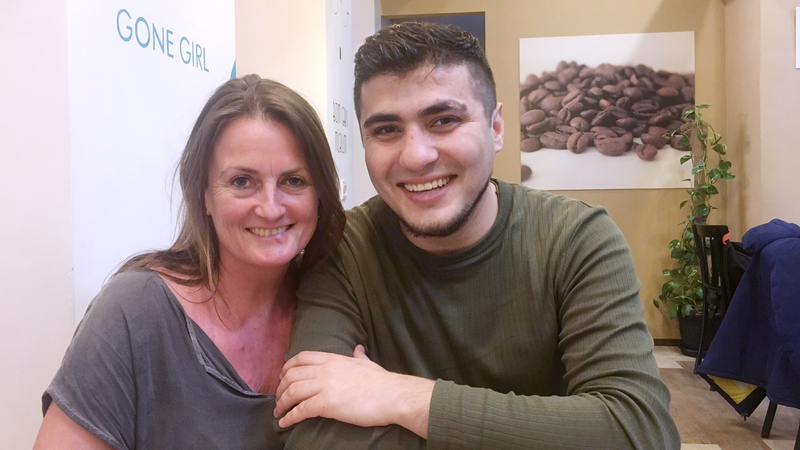 HRHF’s Director Maria Dahle meets with Mehman Huseynov in Baku following his release from prison. Photo: HRHF, 13 March 2019. 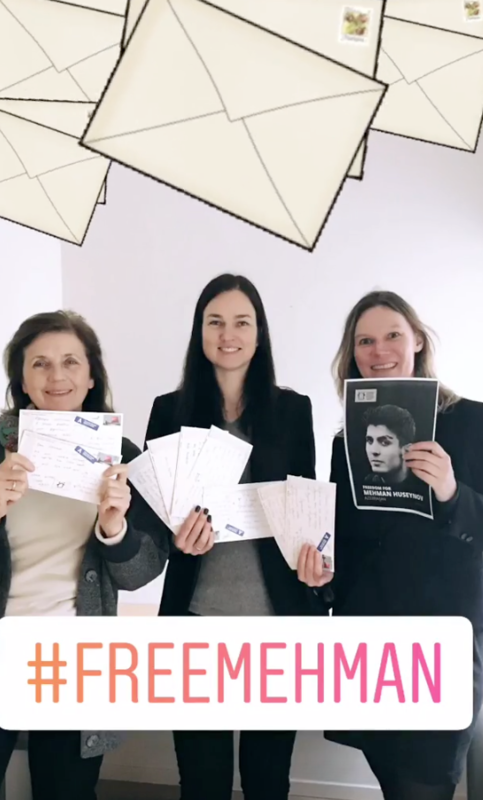 Maria Dahle, Director of HRHF, responds to Mehman Huseynov’s release from prison on 2 March. “We are elated to see Mehman Huseynov released, walking freely as he is greeted warmly by friends, family, media and civil society; we look forward to being with him. 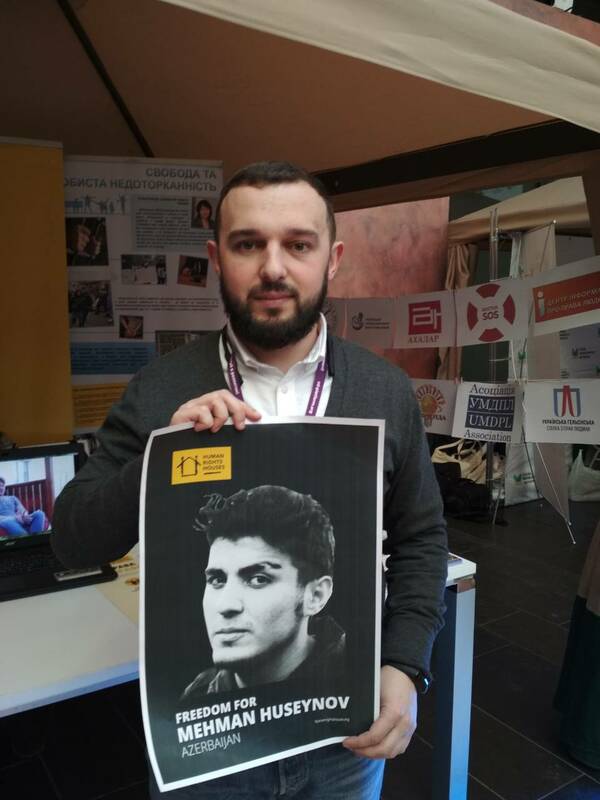 As a journalist and human rights defender, Mehman Huseynov works to improve the society he lives in. His work is legitimate and important, and he should never have been imprisoned or faced threats and pressure for this. To the authorities, we ask that his release marks not only an end to his imprisonment, but an end to the years of repression he has faced. We ask that they fully reinstate his rights and rehabilitate him, and lift the travel ban he has faced since 2012. We welcome indications that his identification and official documentation seized in 2013 have been returned. We will find out fully in time whether the pressure against him has stopped and he has been treated respectfully since the new charges against him were dropped on 22 January. 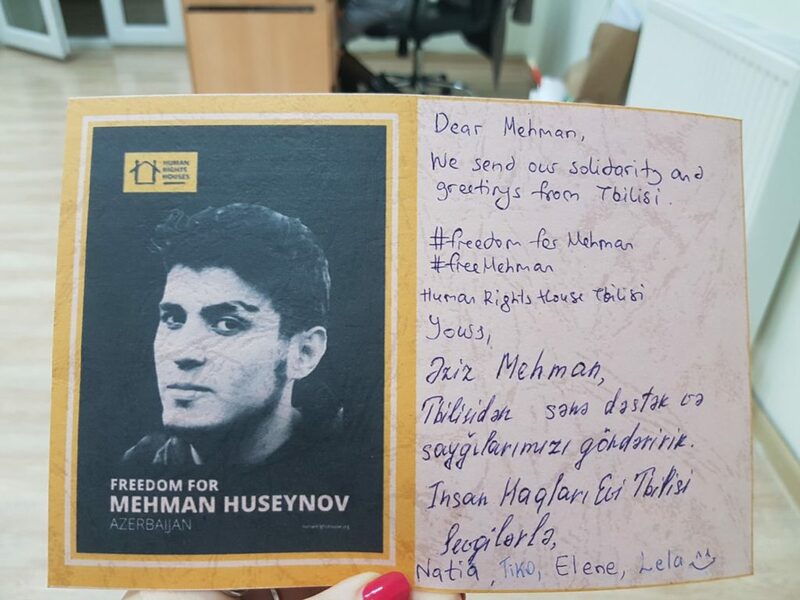 We also ask the Azerbaijani authorities to ensure the lawyers working to uphold Mehman Huseynov’s rights and those in other perceived politically sensitive cases are protected and able to carry out their professional functions without sanctions or threat of disbarment. 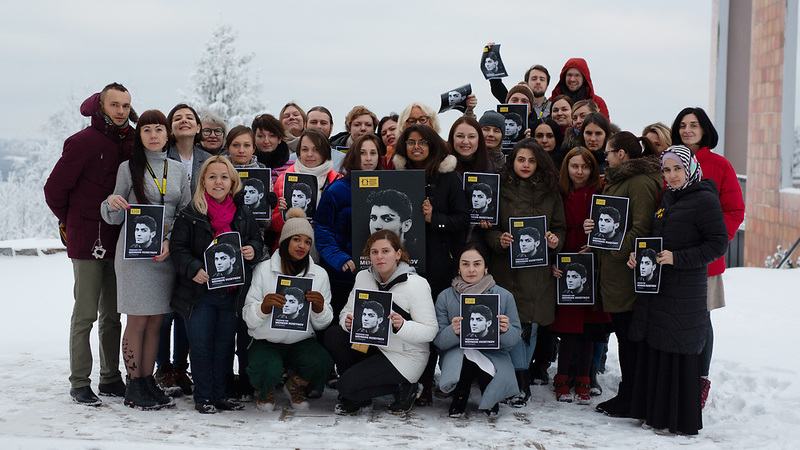 Maria Dahle, Director of HRHF, responds to the December 2018 criminal charges against Mehman Huseynov being dropped. 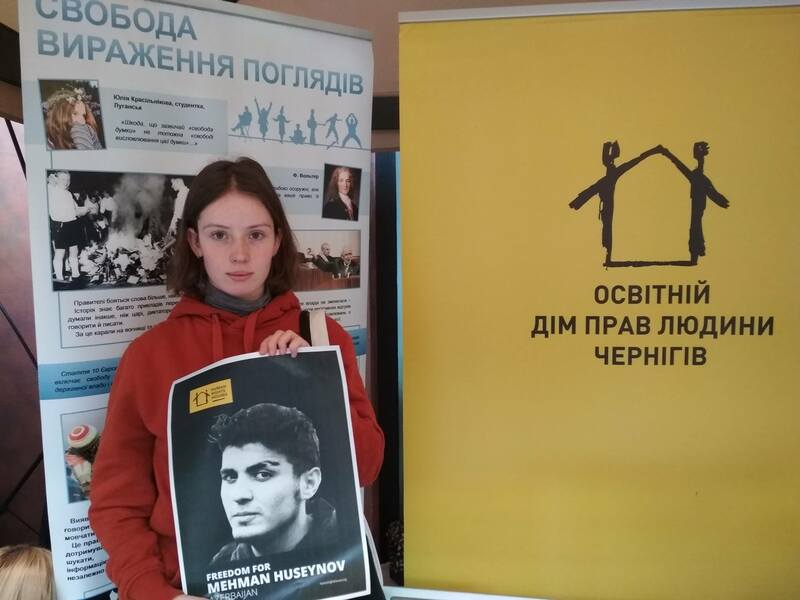 “While it is a positive development that Mehman Huseynov no longer faces a new criminal case, he has already been deprived of his freedom for two years on politically motivated charges. When he is released, by latest 2 March 2019, he will continue to live with the effects of the repression that has escalated against him for many years. 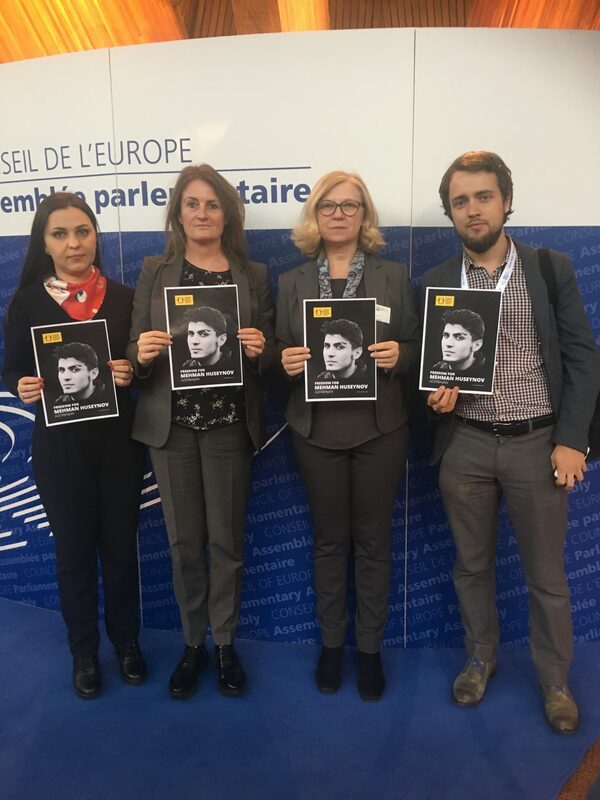 To the authorities, we ask that they ensure Mehman Huseynov’s safety in Azerbaijan and end the campaign of repression against him. We ask that they fully reinstate his rights and rehabilitate him, and lift the travel ban he has faced since 2012 and return his identification and official documentation seized in 2013. The lawyers working to uphold his rights should also be protected, able to carry out their professional functions without sanctions or threat of disbarment. On 10 January, Human Rights House Foundation wrote to the President of Azerbaijan, Ilham Aliyev, appealing for his personal intervention in the case. This letter is available in Azeri and in English. 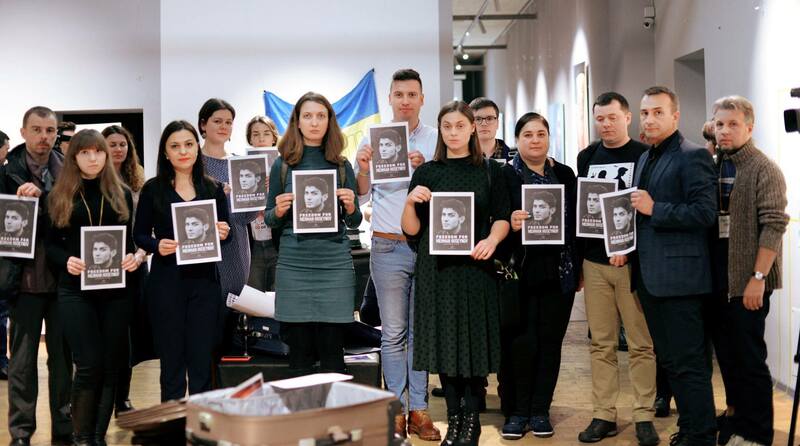 The following day, some 41 member and partner NGOs of 13 Human Rights Houses issued a joint letter calling for urgent action from the international community to ensure the life, health, and rights of Mehman Huseynov. 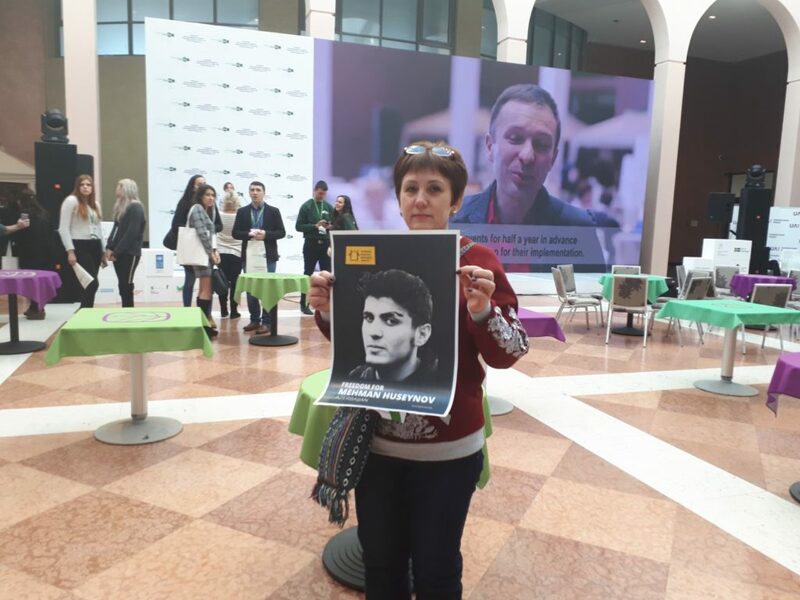 HRHF has warned that lawyers who take politically sensitive cases in Azerbaijan face threats and disbarment, and remains deeply concerned that the same actions may be taken in retaliation against the two lawyers continuing to represent Mehman Huseynov. Due to be released on 2 March 2019, new charges of “using violence to resist a person in authority” could mean he serves up to a further seven years in prison, in addition to the almost two he has already served on charges of defamation – for reporting that he was tortured while in police custody on 9-10 January 2017. The case against him is widely viewed as politically motivated, and Huseynov maintains his innocence. For many years he has been targeted by the authorities and the actions against him show a timeline of escalating repression aimed at silencing him. Throughout his trial for defamation and related appeals, he found no justice in the Azerbaijani Courts, and this adds to concerns that new charges will lead to a lengthy sentence – regardless of their basis in truth. Due to be released on 2 March 2019 following a two-year sentence for defamation, Huseynov was charged on 26 December with article 317.2 of the Azerbaijani Criminal Code for “using violence to resist a person in authority” and could face an additional five to seven years in prison. The prison authorities accuse him of physically abusing a prison guard to avoid a routine check on 26 December 2018. According to one of Huseynov’s lawyers, he denies the accusation by any means, claiming that he did not even get close to the prison guard. He adds that while in prison, since August 2018, several attempts have been made to provoke him into conflict and it was clear that there was a special plan for that purpose. Many international human rights organisations and media outlets have issued statements calling for the charges to be dropped immediately. Huseynov began a dry hunger strike on 26 December 2018 to protest against the new trumped-up charges against him. When his lawyers met him on 28 December 2018, they reported that he was in a bad condition and barely spoke. He had not eaten or drunk anything for two days and claimed he would continue with his hunger strike until the charges are dropped. According to his lawyer, on 30 December 2018 at 3-4 pm, his health condition deteriorated as a result of five days on dry hunger strike and he lost consciousness. He was visited by doctors who concluded that he needs urgent surgery because of vein problems in his leg. But his condition for surgery was not appropriate. A number of medical measures were taken, and it was recommended that he drink water. Human Rights House Foundation is not able to confirm the details of the hunger strike beyond the 30 December. Huseynov was placed in isolation on 26 December 2018 and informed he would face criminal charges. His lawyers were prevented from visiting him until 28 December 2018, when he was already in a critical condition due to the dry hunger strike. 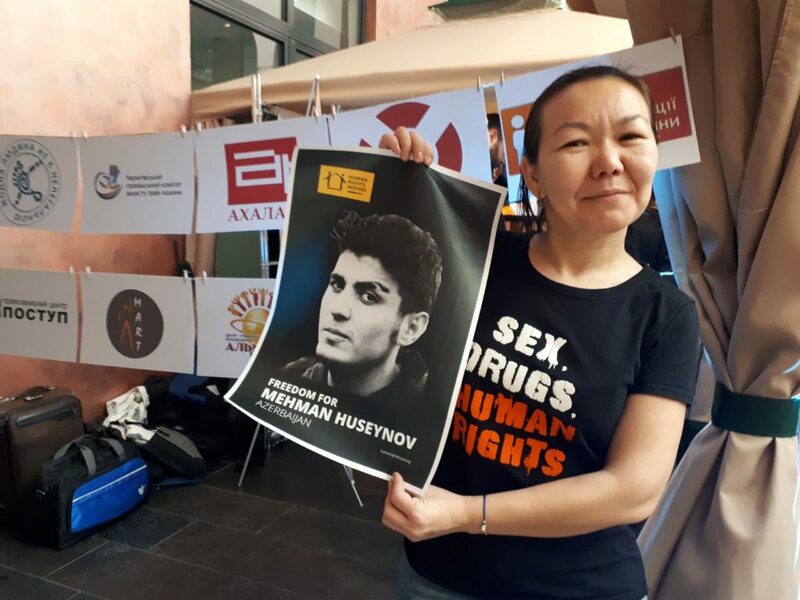 His lawyer went to the detention centre N14 on 27 December 2018, where she was told that Huseynov had been taken to solitary confinement and that a meeting with him would need a special request from “above”. His lawyer claimed this justification was illegal as a lawyer possesses an unrestrained right to meet their client regardless of the place where the prisoner is detained. Ultimately, despite protests, his lawyer was unable to meet with him on 27 December 2018. After a special request, Huseynov’s lawyers met with him on 28 December 2018. Huseynov had been transferred to Baku pre-trial detention centre by 30 December 2018 according to his lawyer. The transfer to the pre-trial detention is connected with the preliminary investigation against him in the new criminal case. According to the statement from the Penitentiary, issued on 7 January 2019, Mehman Huseynov is currently in Kurdahani detention centre nr 1 drinking water and eating bread. He is allowed to meet with his lawyer and to talk with his family members on phone. According to the authorities’ statement, his health is normal. According to news agency Caucasian Knot, representatives from the Azerbaijani Ombudsperson Office have visited Mehman Huseynov in the detention centre and can confirm that he is drinking and that his health is monitored by doctors. Mehman Huseynov is an Azerbaijani anti-corruption video blogger who has for years been targeted by authorities. He remains in prison almost at the end of a two-year sentence for defamation. In response to the now dismissed spurious criminal charges that could have kept him in prison for a further seven years, he began a hunger strike on 26 December 2018. Human Rights House Foundation expressed deep concern about his critical situation and his imprisonment, and the psychological pressure and new criminal charges pursued against him. 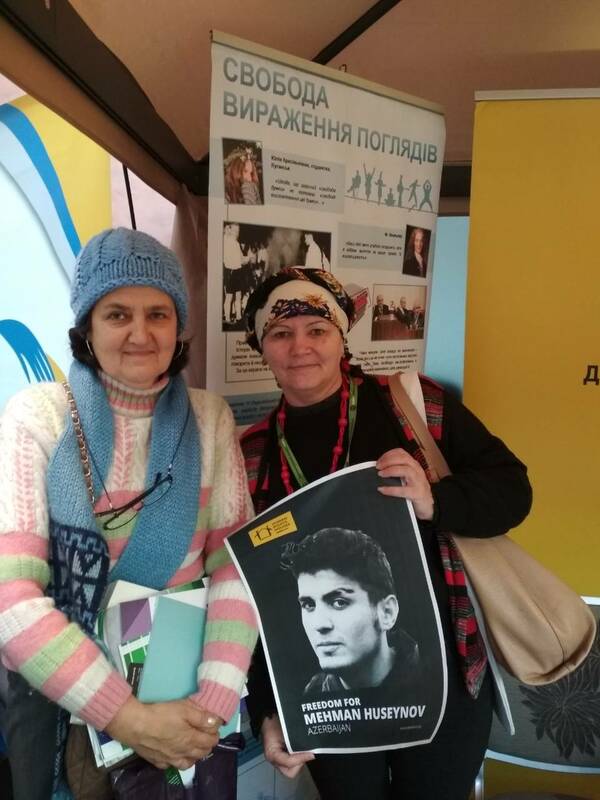 Mehman Huseynov’s well-publicised abduction in January 2017 and later sentencing for defamation were not the beginning of the pressure against him, and with the new charges, we see that they are not the end. 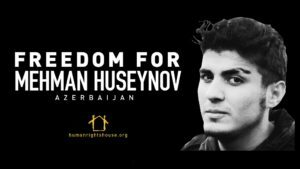 Years of escalating pressure have forced an ambitious young man wanting to improve Azerbaijani society to now be in a critical situation in prison, with actions against Huseynov strongly linked to his human rights and anti-corruption work. 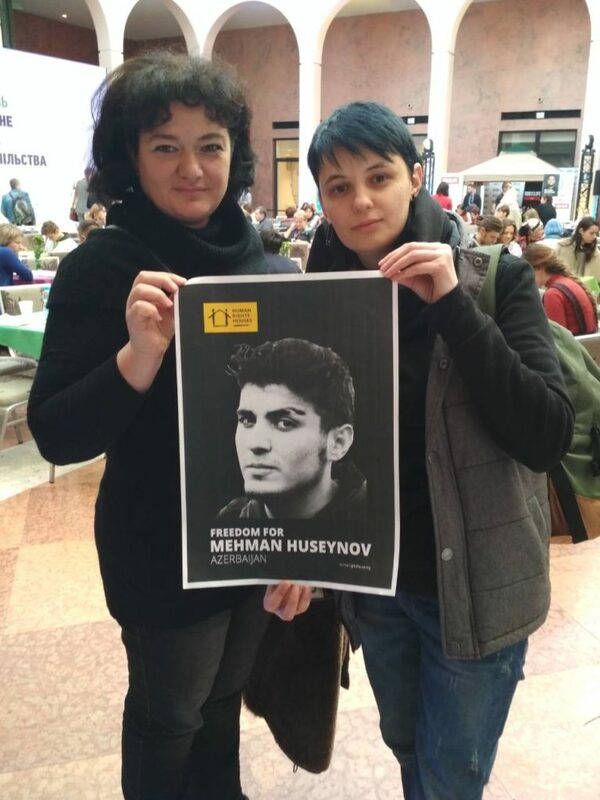 This is a situation that has gone too far, for both Mehman Huseynov and for Azerbaijan. 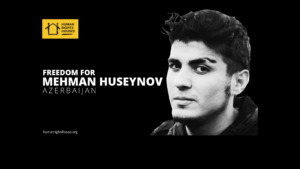 On this page, we provide updated information on the new charges against Mehman Huseynov and on his critical situation. 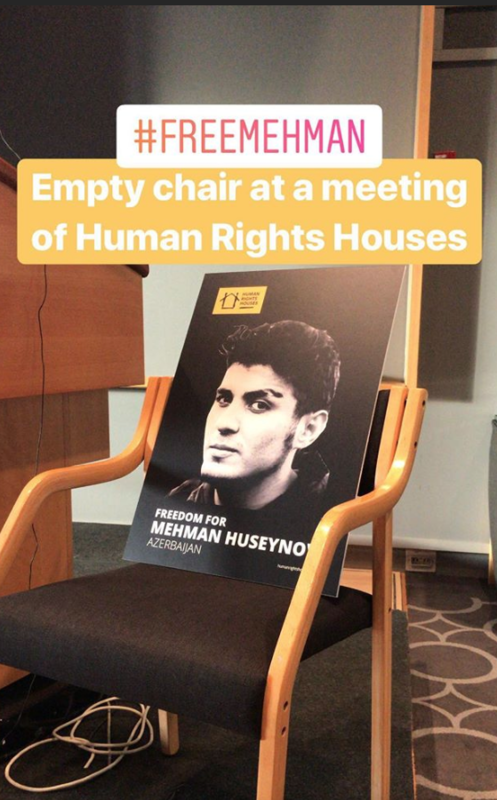 We also tell the story of Mehman Huseynov, to give a better understanding of who he is and his work, and to show how Azerbaiajni authorities have escalated their repression against him over many years. 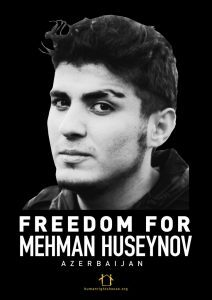 Our “Freedom for Mehman Huseynov” poster can be downloaded for online use and for print. Tetiana Pechonchyk (Crimean Human Rights House), Tatsiana Reviaka (Barys Zvozskau Belarusian Human Rights House), and Emin Huseynov (IRFS, and brother of Mehman). Tetiana Pechonchyk (Crimean Human Rights House), Maria Dahle (HRHF), Tatsiana Reviaka (Barys Zvozskau Belarusian Human Rights House), and Alexander Sjödin (HRHF). 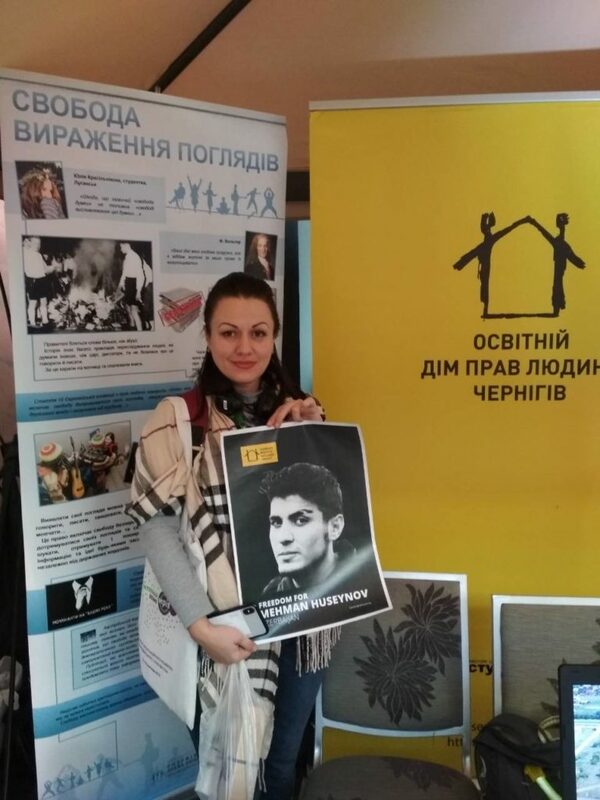 #FreeMehman action during exhibitions displaying the suitcases of Crimean human rights defenders in Kyiv and Chernihiv. 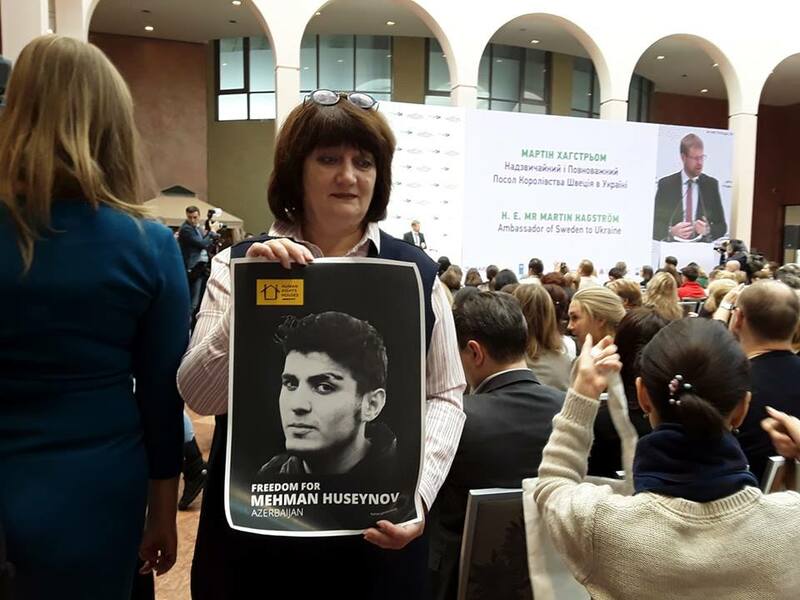 Mehman Huseynov – imprisoned blogger from Azerbaijan. Photo: Crimean Human Rights House, 10/12/18. 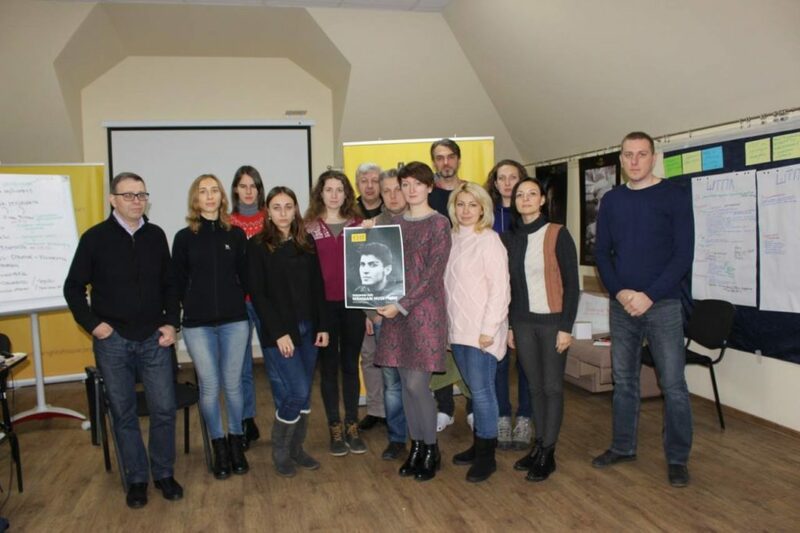 Participants of a planning session for Educational Human Rights House Chernihiv’s “Understanding Human Rights” show their support for Mehman Huseynov. On 2 November 2018, marking the international day to end impunity for crimes against journalists, HRHF launched this solidarity action in support of Mehman Huseynov. In the video above: Mehman Huseynov interviews male members of the public whether they would make their wife vice-president if they were president of a large company, referencing President Ilham Aliyev’s appointment of his wife to the position of vice-president on 21 February 2017. Published 1 March 2017. Mehman Huseynov is an Azerbaijani photojournalist, video blogger, and human rights defender imprisoned on charges of defamation for his coverage of inequality and corruption. He reaches out to everyday citizens through his videos, where his personal touch and sense of humour have earned a substantial following on his social media accounts. His valuable commentary has been essential in stimulating debate on issues affecting Azerbaijanis. Through his work, Mehman Huseynov challenges the crackdown on independent media in Azerbaijan, and has become a symbol for the fight for free expression in the country. His unique style of journalism and focus on self-publishing has helped him to reach large audiences with almost two million views on his YouTube channel. In 2013, he began posting on Facebook, under the name SANCAQ, where he now has more than 335,000 followers, his SANCAQ Instagram account has more than 167,000 followers. 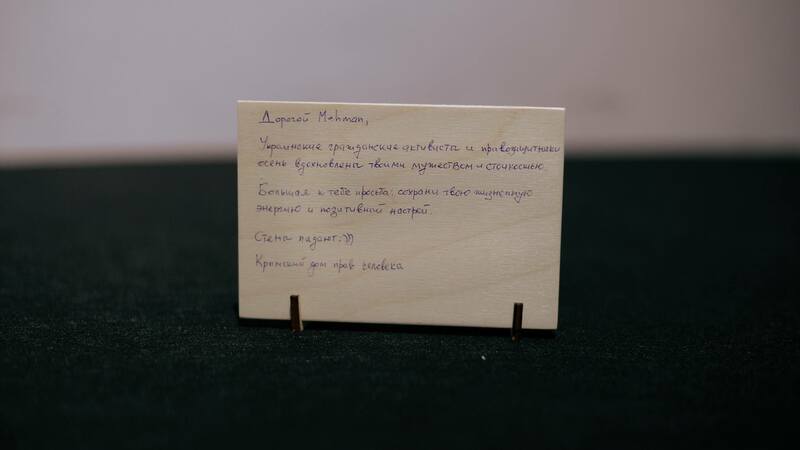 Since his imprisonment, his social media accounts have been taken over by his brother, Emin Huseynov. His work as a photojournalist has been used by news outlets, magazines, and NGOs alike, including in particular his coverage raising awareness of the human rights situation surrounding the Eurovision song contest and the authorities’ crackdown on peaceful protests in the country at the time (Sing for Democracy campaign). 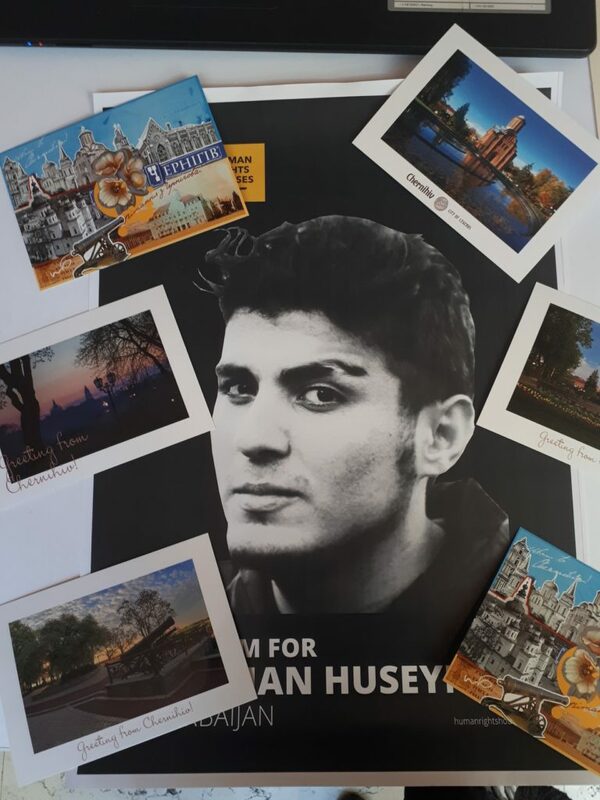 Mehman Huseynov was awarded in 2013 with the Free Media Award from Fritt Ord Foundation and the ZEIT-Stiftung. He was awarded for one of top three photos in the first annual Freedom House photography and art contest in 2012, and received an award as part of “Youth in Action: a Snapshot of Democracy” contest by the World Movement for Democracy in 2012. He was one of the 2010 winners of the Democracy Photo Challenge by the US State Department. In 2019, he was among 15 human rights defenders and organisations shortlisted for the Index on Censorship Free Expression Awards in the “Journalism” category. Mehman Huseynov (left in yellow vest) carrying out his duties as a photojournalist in 2012. Photo: IRFS. The story of the Institute for Reporters’ Freedom and Safety (IRFS) is intrinsic to the story of its chairperson Mehman Huseynov. The organisation was established in 2006 by journalists Emin Huseynov and Rasim Aliyev in response to growing restrictions on freedom of expression and freedom of press in Azerbaijan. IRFS has constantly been at the forefront of protecting targeted journalists and raising awareness of the dire situation of expression in Azerbaijan. 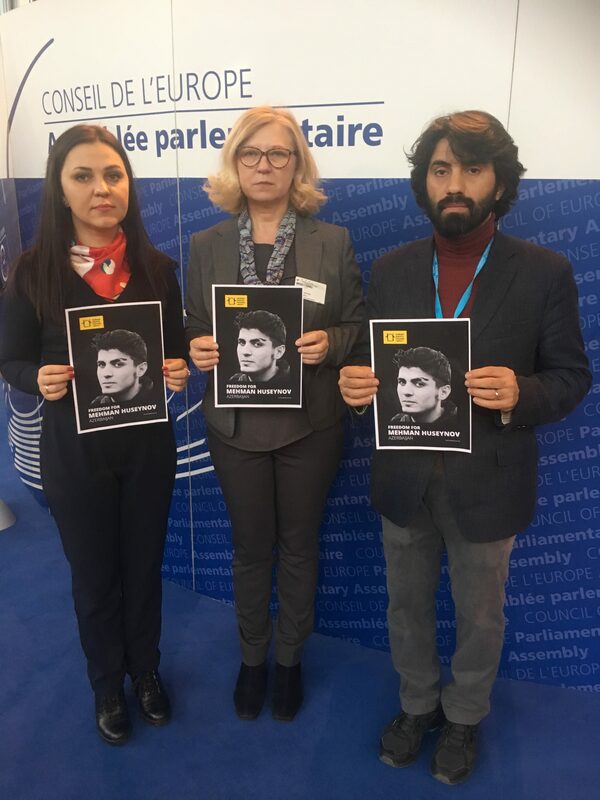 All three of IRFS’ leaders have been targeted as a result of their work with one in exile, Mehman Huseynov in prison, and one dead following a violent attack. In 2014, Emin Huseynov, the organisation’s then chairman, was forced into hiding in the Swiss embassy for 10 months and until he was able to flee Azerbaijan. During this time, the authorities targeted his brother Mehman, as well as interrogating their mother. The next chairman of IRFS, journalist Rasim Aliyev, died after being violently attacked in August 2015 in Baku. The attack has been linked to his work exposing police brutality and social discontent. In November 2016, Mehman Huseynov was elected as IRFS’ new chairman. 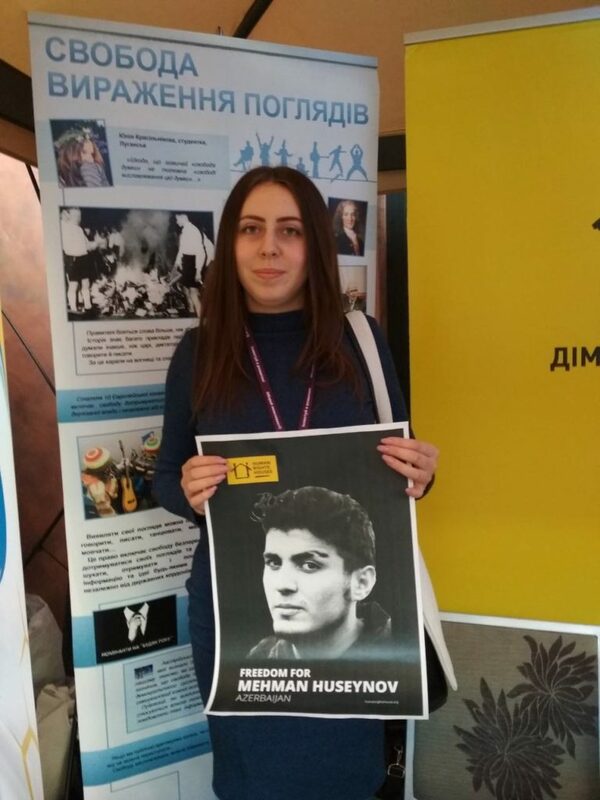 Yet, it was many years before – in his teenage years – that Mehman Huseynov became involved with IRFS through his brother. This began his journey from a photographer, to a journalist, to the chairman and popular video blogger that he is today. This journey of professional development has been hindered and marred by harassment. 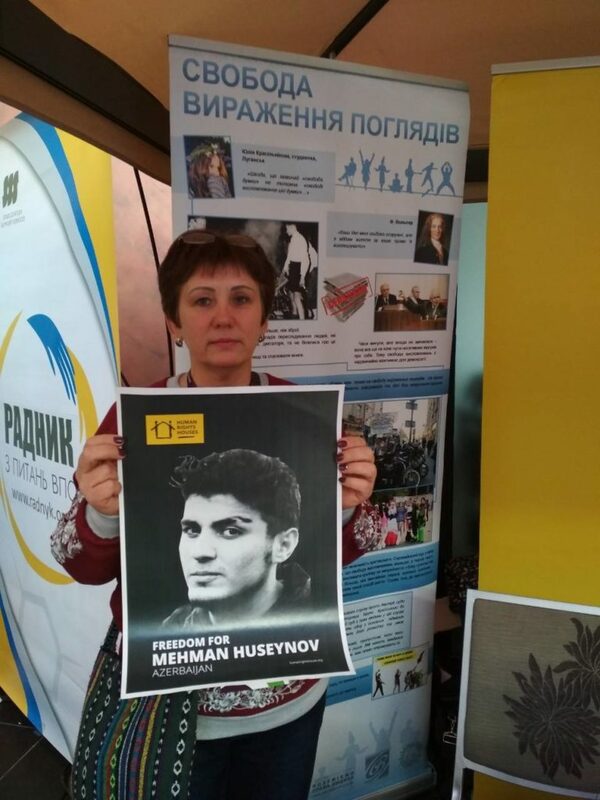 Prior to his first arrest in 2012, Mehman Huseynov had been the target of police questioning related to IRFS and its activities. On 7 March 2011, Mehman Huseynov and Abulfat Namazov from the Institute for Reporters’ Freedom and Safety (IRFS) were interrogated by police, for two hours after being forced out of their car in Baku. They were questioned about Huseynov’s Facebook account, a protest action on 11 March and the activities and employees of the IRFS. The police advised Huseynov to be less active on social media networks. Mehman Huseynov was first arrested on accusations of hooliganism on 12 June 2012 linked to a verbal disagreement with police at an unsanctioned protest in front of the Baku Mayoral Office that occurred on 21 May 2012. 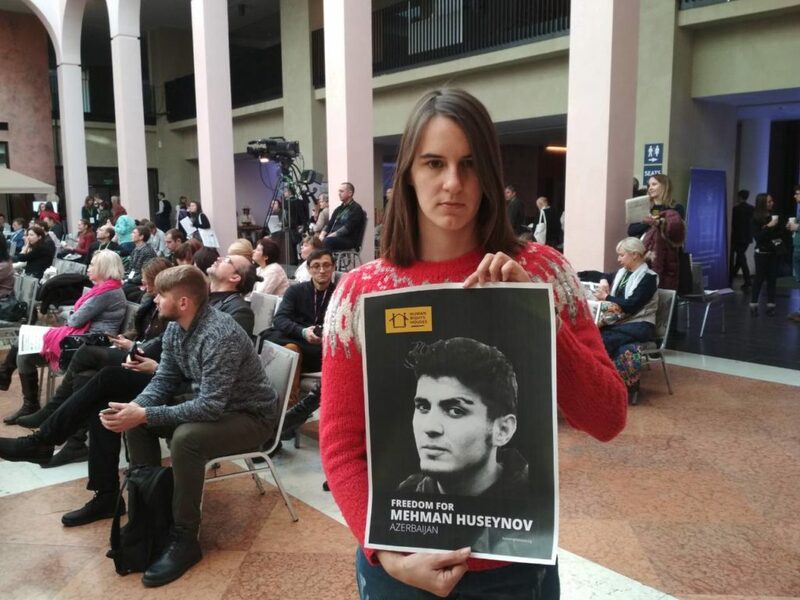 He was at the event carrying out his professional duties, when police used force against both protesters and journalists, including Mehman Huseynov and other IRFS employees. The police broke the camera that Mehman Huseynov was using at the event. Linked to this, he received a travel ban, which he discovered at Baku airport on 17 June 2013 when he attempted to travel to Norway. This travel was to receive the Fritt Ord and ZEIT-Stiftung Free Media Award. On being detained at the airport, he was taken to the police station in Baku, where authorities confiscated his official documents and ordered him to sign a pledge that he would not leave Azerbaijan. Since then, he has been regularly interrogated by authorities and remains under the travel ban and without documents. Living without identification and official documentation has closed the country’s infrastructure to him, preventing him from accessing things such as public healthcare and further education. IRFS has been behind several joint initiatives in Azerbaijan, such as the online TV channel, ObjectiveTV, which received the Fritt Ord and ZEIT-Stiftung Free Media Award in 2014. In 2009, IRFS became a formal member of Human Rights House Azerbaijan, as well as a member of the regional cooperation platform, the South Caucasus Network for Human Rights Defenders. IRFS is also a member of IFEX. In addition to attacks, threats and harassment against its staff and their family members, the organisation has suffered from administrative blocking of the organisation from being able to operate in Azerbaijan. 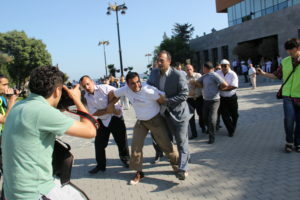 2012: Mehman Huseynov (left in striped shirt) documents “Sing for Democracy” action in Baku. In May 2012, his work as a photo journalist covered the “Sing for Democracy” action, in response to the Eurovision Song Contest held in Baku that month. 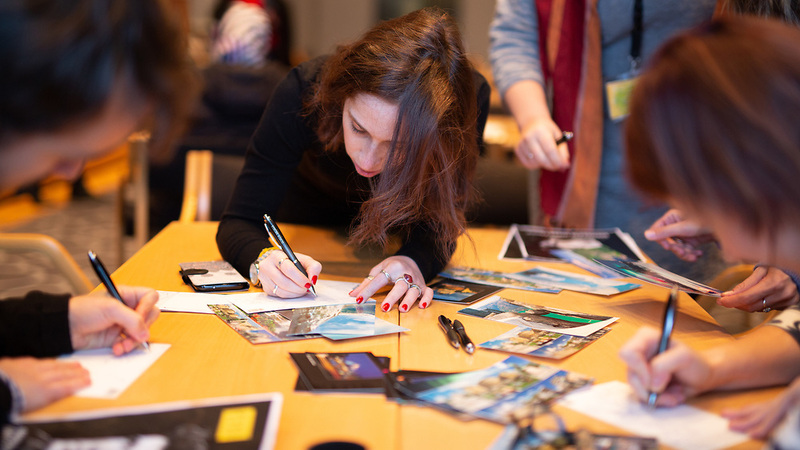 May 2012: Mehman Huseynov (left edge of photograph in white) documents a meeting between Swedish Eurovision winner Loreen, Human Rights House Azerbaijan, Human Rights House Foundation, and Civil Rights Defenders. 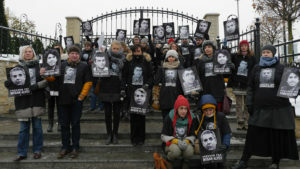 Members of the network of Human Rights Houses calling for the release of Azerbaijani political prisoners in 2014 outside the Azerbaijani embassy in Kyiv, Ukraine. Freedom of expression is severely limited in Azerbaijan, and there has been an active crackdown on independent civil society and independent media which intensified 2013. This has led to many working journalists and human rights defenders being attacked, imprisoned, and fleeing the country, especially those working on perceived sensitive issues such as inequality and corruption. These are the issues that the authorities have sought to remove from the public space through the crackdown on and repression of civil society, the shutting down of protests, and the targeting of political opposition. By continuing to actively publish independent and critical work as a video blogger and photo journalist on such sensitive issues, Mehman Huseynov resisted these restrictions, stepping up to fill the void left behind by those in prison and exile by putting himself at risk to provide essential, independent commentary to the people of Azerbaijan. Mehman Huseynov, was pushed into a vehicle in Baku, Azerbaijan, on 9 January. He was then abducted by police agents and faced administrative charges of resisting police. Prior to the abduction, Mehman Huseynov became the chairman of IRFS in November 2016. In December 2016, he shared a video in which he contrasted the financial difficulties of elderly citizens with the “palaces” built by members of the government. Video above from Mehman Huseynov’s YouTube channel, video published on 13 December 2016. Just months before, on 10 September 2016, he was taken to a police station and interrogated and threatened with torture. On being released by police after his abduction, Mehman Huseynov reported that he was tortured – which is consistent with the findings of an examination by an independent team of medical doctors, sent from Front Line Defenders and the Georgian Centre of Psychological and Medical Rehabilitation for Torture. He was sentenced to two years in prison for defamation on 3 March 2017, based on him reporting that he was tortured while in police custody. Mehman Huseynov maintains his innocence and has called the case against him politically motivated. 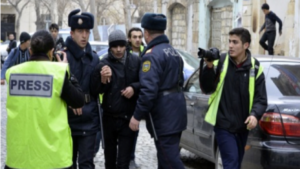 His sentencing came amid sustained attacks on media freedom in Azerbaijan, such as against the Turan news agency and Azadliq newspaper, and their staff. Prior to him being sentenced on 3 March 2017, he was active in his work. Immediately prior to his sentencing for defamation, he published a video on 1 March 2017 asking male members of the public whether they would make their wife vice-president if they were president of a large company. The video contributed to the public debate around President Ilham Aliyev’s appointment of his wife to the position of vice-president on 21 February 2017. On 2 March 2017, he delivered a speech at the memorial service of journalist and editor-in-chief of Monitor magazine Elmar Huseynov (no relation), who was murdered in 2005. 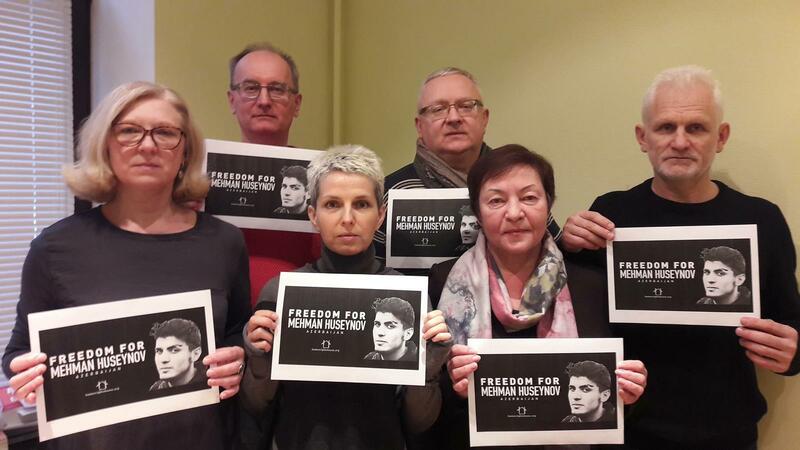 On 9 March 2017, 50 member and partner NGOs of Human Rights Houses wrote to the Azerbaijani President and authorities to call for the immediate and unconditional release of Mehman Huseynov. 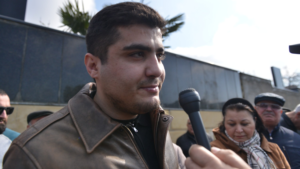 Mehman Huseynov has appealed at all levels of the Azerbaijani court system against his sentence for defamation. Bringing this process of domestic appeals to an unjust and unsatisfactory end on 25 June 2018, the Supreme Court Azerbaijan upheld Huseynov’s two-year sentence. All allegations of torture were dismissed and not considered further by the courts. Throughout his trial for defamation and related appeals, he found no justice in the Azerbaijani Courts, and this adds to concerns that new charges (put forward on 26 December 2018) will lead to a lengthy sentence – regardless of their basis in truth. The police chief of the station where Mehman Huseynov was detained took the allegation as a personal insult and pursued a charge for defamation. However, Mehman Huseynov’s defence has repeatedly asserted that the charge implies defamation against a concrete individual, while Mehman Huseynov in his statement did not mention individuals but criticised the system generally. While the Courts allowed Huseynov to give a statement during his appeal hearings, they rejected all other motions put forward by his lawyers. These motions included for the restrictive measures to be changed and Huseynov freed, for him not to be held in a cage, for the Court to investigate video evidence, and for the police chief who brought the case for defamation to testify in Court. Mehman Huseynov appealed for conditional release in August 2018, having completed two-thirds of his sentence. The District Court rejected this on accusations of bad behaviour by an employee of the prison facility where he is held. In an appeal hearing on 10 October 2018, his defence unsuccessfully petitioned for this employee to attend the next court hearing on 17 October. Another employee of the prison attended the hearing on 10 October in his place. During the hearing, Mehman Huseynov complained of psychological pressure towards him. According to his defence, he was not allowed to make phone calls and he had been made to understand that he can be punished for informing other prisoners about their rights. 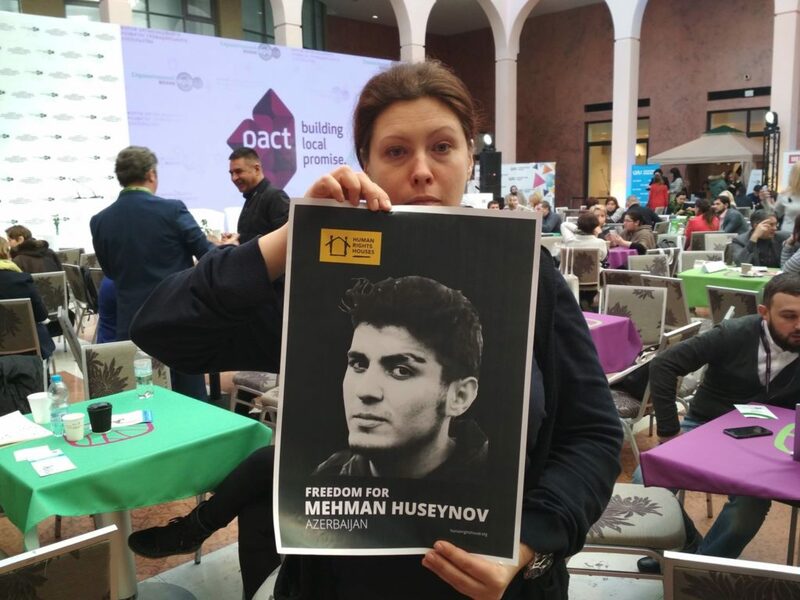 Mehman Huseynov’s hearing at the Appeal Court continued on 17 October 2018. The Court did not satisfy his appeal for conditional release and upheld the decision by the District Court. During the hearing, his defence stated that he had not breached the order of the penitentiary facility nor did he have any disciplinary misconduct. His lawyer also indicated that it is voluntary to participate in different activities in prison and that it is wrong to present non-participation as a violation, as done so by representatives of the prison administration when setting out grounds to reject Mehman Huseynov’s appeal.